The Vancouver School Board needed a Mobile Application. VSB is a large, urban and multicultural school district responsible for 109 schools and over 55,000 students. They are committed to providing the highest quality learning experience for all students while helping them to reach their intellectual, social, and physical potential in a safe and inclusive environment. 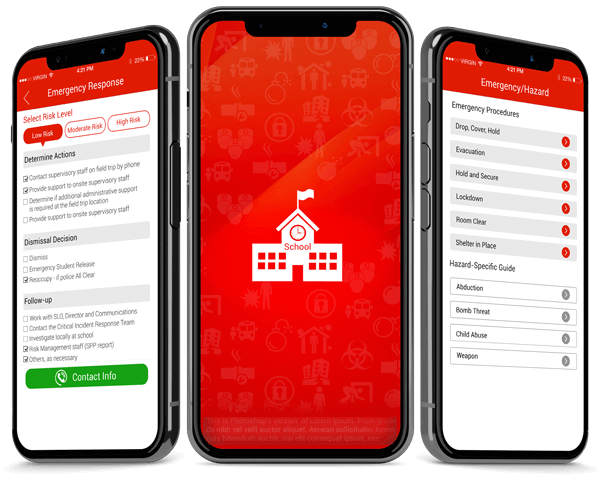 The client had a challenging problem to solve with an iOS Android App: to provide principals in the school district with an easy to access resource for emergency situations. The current system required principals to go back to their office, and pull out a reference binder of information for varying emergency situations, as well as it required the VSB to constantly maintain up to date binders or information in each school and district. A mobile application for both iOS and Android was needed to present this data in an easy to access manner and add automated action functionalities, so that as buttons are pressed in the emergency results take place instantly. Three pieces of software were built to implement the solution, a native iOS application, a native Android application, and a web-based Administration panel to manage the app data and users. Integrations with automated SMS messaging services allow instant connection to problem-solvers in emergency situations. A fully automated backend allows the VSB to add on new districts at any time with their own set of emergency data, contacts and outcomes.